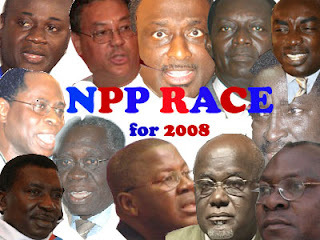 The New Patriotic Party (NPP) today, Tuesday October, 2007 begins the vetting of its aspiring presidential candidates to ensure that the aspirants qualify to contest the position of President of Ghana. The nine-member vetting committee consists of five chairpersons of the standing committees of the National Council and three persons appointed by the council, one of whom shall be designated chairperson of the committee.Briefing the Daily Graphic in an inter¬view, the National Chairman of the NPP, Mr Peter Mac Manu, said the national council shall also ensure that at least two of the nine members were women.Although he did not give any specific date for the submission of its report, he said the committee would finish its job before the congress in December 22 to give room for the filing of appeals, if any. The members of the committee include Major Courage Quashigah; the Minister of Health, who is also the Chairman of the Disciplinary Committee; Brigadier Obeng, the Chairman of the Organising Committee; Mr Samuel Odoi-Sykes, the Chairman of the Disciplinary Committee; Mr Peter Ala Adjetey, a former Speaker of Parliament and Chairman of the Constitutional Committee.It is chaired by Prof Daniel Adzei-Bekoe, the Chairman of the Council of State. The two women include Madam Ama Busia.Article 9 (C) (f) (iii) of the NPP constitution says, "The vetting committee shall disallow the candidature of any aspirant when it finds that such an aspirant does not qualify to be a presidential candidate. It shall submit such a finding in writing to the National Executive Committee, with a copy to the aspirant. "Sub-section (iv) also states, "An aspirant who is dissatisfied with such a finding, may appeal against it to the National Executive Committee within 48 hours of receipt of notice of the finding by filing an appeal in writing with the General Secretary.The National Executive Committee shall give its decision within seven days of receipt of the appeal. The decision of the National, Executive Committee on the appeal shall be final."